This weekend, downtown St. Louis will be festival for your senses…the hiss of a grill, the sound of forks scraping plates, the smell of warmed fresh bread, and the feeling of fire-hot french fires on your fingers. It’s time again for the Taste of St. Louis in Soldier’s Memorial, and this year, the Taste is going green, and we don’t mean Caesar salad. The event’s organizers are launching a dramatic new effort to reduce the Taste’s environmental impact, and hope that their system will catch on nationwide. Among their efforts to go green, the Taste has reduced their printed marketing materials by more than 70%, use biodiesel, solar and propane generators, require compostible flatware, and of course, are encouraging everyone to use alternative modes of transportation. That means taking transit, biking or walking to Soldier’s Memorial, located at 12th and Market. How can you travel green to the Taste of St. Louis? The #4, 10, 11, 30, 32, 41, 74, 94, 97, 36X, 58X , 410X buses will have short reroutes due to Market Street closures for the Taste, so check out Google maps of the reroutes to plan your trip. Early October is a great time in St. Louis to get your bike and travel the region. You can bike to the Taste of St. Louis by finding a route on the Bike St. Louis trails, or combining biking with transit. When you get to the Taste, the St. Louis Regional Bicycle Federation is providing free secure valet bike parking. And who doesn’t want a little exercise after all that food! Do you live within a couple of miles to downtown St. Louis? What about getting some great exercise? Walking to more events and attractions cuts down on traffic, parking hassles, and gives you a stress-relieving cardio boost. Use Google Maps or a local atlas, find a good route and a walking partner, and earn the right to enjoy your tastes of St. Louis! Taking transit, biking or walking is a great way for anyone to reduce their impact on the local environment, and to take a real bite out of what St. Louis cities and neighborhoods have to offer. 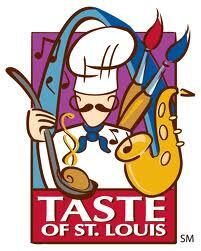 For all the details on the event’s food, music and activities schedules, visit www.tastestl.com. I was really impressed how prominently the Metro information was featured. Great job to all who made this happen! My only complaint is that the Taste website does not warn people about the reroutes. I’m glad to see the reroute alerts are a lot more visible on the Metro home page than they used to be. However, it is still true that only the initiated will look at these. It would be great for the Taste website to tell about the reroutes too. We’ll be biking to our nearest Metrolink station and taking the train, thanks to the free passes we won from Metro. WOOO!